Today’s Gospel is a bit uncomfortable, especially if you grew up listening to stories about Jesus in Sunday School. When I went to Sunday School, Jesus was always presented as this mellow guy with long flowing hair, in sandals and a nice white robe, telling stories. Jesus loved the little children. He was always holding lambs. That’s not the Jesus we encounter today. Today, Jesus is angry. I was talking to my mother earlier this week, as I was preparing to preach. Many of you know my mother is also an Episcopal priest. She laughed as I talked through some of my sermon preparation. She said that she was glad she didn’t have to preach this week, especially because at her church in Denver she would spend most of this week preparing for the Church’s annual silent auction. It seems her parish spent this week setting up money-changing stalls, in the Sanctuary of the Church…My mom was glad to let the rector preach on Jesus overturning tables in the temple the next day. This isn’t an easy story for us. Jesus is angry. Our story today is probably the biggest outburst of Jesus’ anger in the Gospels. But overall Jesus was not the beatifically peaceful storyteller of my Sunday-school education. Jesus of Nazareth went around Palestine calling the Pharisees a “brood of vipers,” hurling epithets at Herod, “that fox.” and telling Peter, “get behind me Satan.” Jesus had a temper. 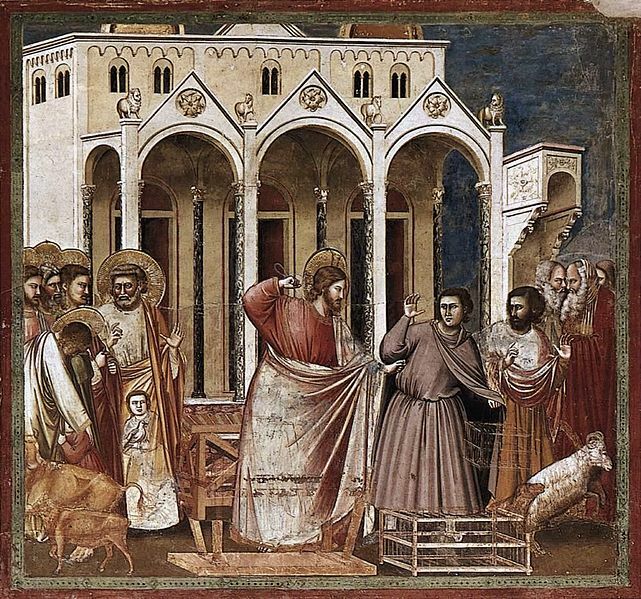 Today we read about the incident in the temple where Jesus drives out the animals and sends the moneychangers’ coins cascading onto the cobblestones. I think we like to avoid this angry Jesus because our society has such issues with anger. Overall, we do not handle our anger well. Our society also likes to suppress anger until our anger bursts out in inappropriate ways. For me, these bursts of anger usually occur when I’m faced with driving around Washington DC’s taxis. Taxi drivers in this town are probably the most usual recipients of my angry words. I’ll grant you, the taxi drivers in this town merit some righteous wrath, but the other day I was driving with a friend in the car and I sort of forgot she was there. Suddenly I realized what I was saying and became very embarrassed of the volume of my voice and my words. I am still learning how to handle my anger. I suspect I am not the only one here who struggles with the emotion. I think overall as a society we’re not very good at handling anger. We really don’t we do not handle anger well, but we need to learn to, because I believe anger is a gift of God. We are supposed to get angry. Anger is the emotion of change. When we get angry, we get up and do something. We work to change the situation. Have you seen that bumper sticker: “If you’re not angry, you are not paying attention?” Our world is not as it is meant to be. Our world is not what God means the world to be, and we ought to be upset. I do not think we are nearly angry enough. I don’t think I’m nearly angry enough. A little over a week ago, I was out on a street corner in Chinatown with the Washington Interfaith Network. We were outside of a breakfast meeting, being held between city council members and firms who are receiving massive subsidies to build hotels and condos in the District. We were there to remind the city leaders of their promise to support affordable housing in the district. There are 26 thousand families on the waiting list for affordable housing. Last year, the city cut $18 million out of the city budget for affordable housing, a year that ended with a huge budget surplus for the city. We were there to remind city officials, in front of reporters and daily commuters, of their promises to ALSO support those who struggled to make ends meet. We did not get far on that street corner. There was a write up in the Washington Post, but no new promises were made. The problem on the street corner: we were too nice. When the leaders of the gathering came together after the protest, we decided that our group was not nearly upset enough. In front of the cameras and the officials, we were too timid, not angry enough. If the Washington Interfaith Network wants to create change, we are going to have to get angry. We are going to have to really open eyes of our city, and to do so, we’re going to have to use anger. Jesus used anger. The verb object arrangement is really key in that sentence: Jesus used anger. Jesus had control over his anger. Jesus’ anger did not have control of him. Jesus was not overreacting. Jesus’ anger was direct, channelled. He used his anger to create change. Jesus was upset at the state of the temple. He was frustrated by the expression of religion. A spiritual reality had been diluted into an economic exchange, and Jesus was not going to be nice about it. The incident works because it is a bit of a surprise. Jesus has a temper, but it’s not a short one. There is a balance to Jesus‘ anger. He does not go on to rush up the steps of the temple and continue shouting. He does not charge the palace gates. He clears the temple square, and the moment is over. He begins teaching. You’ve seen anger managed like this, used like this, if you’ve ever seen really good parenting. In their most artful moments, good parents allow their children to see they are upset, but they do not fly off the handle. I believe God wants us to use our anger. God gives us anger in order to create change in our lives and in our world. So often we misdirect the gift. Anger is meant to help us put an end to injustice. Anger is a gift to motivate us to fight for the causes and the people worth fighting for. We need to learn to use that gift. Learning to manage and use the gift of anger is a life’s work, but if we are going to walk in the way of Jesus, we are going to have to learn to use our anger, the way Jesus did. How? The disciples give us a practical clue in this lesson. When faced with the angry Jesus, they remember a psalm, a very angry psalm. A lot of the psalms are angry, specifically they are angry with God. “How long O Lord?” must be one of the most prevalent questions in the book. Anger is a tough emotion to manage, and we would to well to bring more of our anger to God. I think a lot of our prayers are too timid. We are too nice when we pray. Our prayers sound an awful lot like that old Monty Python sketch where John Cleese is dressed up as a priest leading services in an English church. He begins the prayer, “Oh God you are so big, so unimaginably huge…” Our prayers are too ethereal. The psalms are gritty. The psalms are full of anger AT God. The psalmist believes God can handle our anger. I think we could all use some more psalm reading. Praying to God, “Why O Lord, do you allow me to suffer?” “Why, O God, is our world so broken?” I think there is ancient spiritual wisdom there in those prayers. I think it would be better if we brought God more of our anger, rather than letting our anger go on family members, or co-workers, or DC cab drivers. Who knows, maybe if we give God our anger, God can show us how to use it.